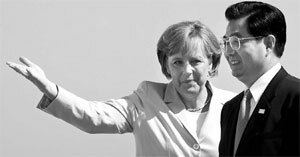 HEILIGENDAMM, Germany: President Hu Jintao busied himself with a series of bilateral meetings with leaders of other nations on the sidelines of the Group of Eight (G8) summit here on Friday. Hu met Japanese Prime Minister Shinzo Abe, French President Nicolas Sarkozy, Canadian Prime Minister Stephen Harper, Russian President Vladimir Putin, Italian Prime Minister Romano Prodi and German Prime Minister Angela Merkel. Speaking at the opening of his talks with Abe, Hu reviewed the successful ice-breaking visit by Abe last October, saying he appreciated the efforts made by Japanese people in various fields to improve Sino-Japanese ties. Specifics about their talks were not available by press time, but the two leaders were likely to take up the issue of climate change given it was a major topic at the G8 summit. Japan is keen on creating a new climate change framework beyond the Kyoto Protocol, the current pact, to involve major gas emitters such as China, India and the United States. Included in their topics might also have been the Korean Peninsula nuclear issue as both are members of the stalled Six-Party Talks aimed at denuclearizing the peninsula as well as the pending issues such as oil exploration in the disputed East China Sea. It will be Abe and Hu's first meeting since they met on the sidelines of the summit of the Asia-Pacific Economic Cooperation forum in Hanoi last November. Before meeting with Hu, Sarkozy said he will raise his concerns over China's currency exchange rate with the Chinese president. China has always insisted the reform of the yuan will be a gradual process. In his first official contact with Beijing since taking office last month, the French president acknowledged "China's considerable role in the world" in a telephone conversation with Hu. "There will be no solution on the question of Iran, on the question of Darfur, on the question of Korean nuclear issue, without strong and positive Chinese involvement," he was quoted by a spokesman. Sarkozy might visit China later this year as Hu invited him to visit Beijing, an offer the French president accepted "without hesitation", according to French sources. Sarkozy strongly opposed calls for a boycott of the Beijing Olympics to force China to back international action in Darfur.